The tyre monitor display uses data from the ABS sensors and other functions to check the speed of rotation and the rolling circumference of the individual wheels. Any change in the rolling circumference of one or more wheels is shown by the tyre monitor display in the instrument cluster. if the tyre pressure has been changed manually. if the tyre pressure is too low. if the tyre has structural damage. if the vehicle is loaded more heavily on one side. if the wheels on one axle are loaded more heavily, e.g. high payload. if snow chains have been fitted. if a temporary spare wheel has been fitted. if one wheel per axle has been changed. The tyre monitor display may, in certain circumstances, become slow or may not display anything, e.g. with a sporty driving style, winter driving conditions or on unpaved roads or when driving with snow chains. The tyre monitor display will have to be re-calibrated after changing the tyre pressure and after changing one or several wheels. This also applies for changing the wheels, e.g. from the front to the rear. Switch on the ignition . Press and hold the button until a confirmation signal can be heard. OR: Depending on the equipment, select the menu option Tyre pressure in the instrument cluster and save the new tyre pressures . The system calibrates itself independently in normal vehicle operation for the tyre pressures filled by the driver and the tyres that are fitted The recorded values are adopted and monitored after a long journey at various speeds. If the wheels are loaded more heavily than normal, e.g. heavy payload, the tyre pressure must be raised to the recommended full-load tyre pressure before calibration . Improper use of the setting button can cause the tyre monitor display to give false warnings or to give no warning despite dangerously low tyre pressure. 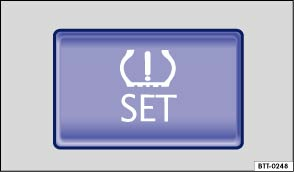 Make certain the tyre pressure of all tyres is correct before using the setting button. The tyre pressure monitoring system stops working if there is an ESP/ABS malfunction . If a warning is given about tyre pressure being too low, the vehicle should be stationary for approximately one minute and should not be moved nor should the ignition be switched off and back on again until the button for tyre pressure display is pressed to recalibrate the system. When using snow chains, an incorrect display may be shown as the snow chains increase the tyre circumference.